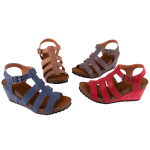 Fashionable and practical, you can wear this mid high strappy wedge sandal with anything from jeans and shorts to skirts and dresses. We’ve added the MOTION pattern to our popular mid height wedge. A strappy banded sandal with a matching snake covered wedge wrap designed to keep your feet comfortable all-day long. It features our molded cork footbed with thick memory foam padding that molds to your foot for superior comfort that you can wear all day or night.